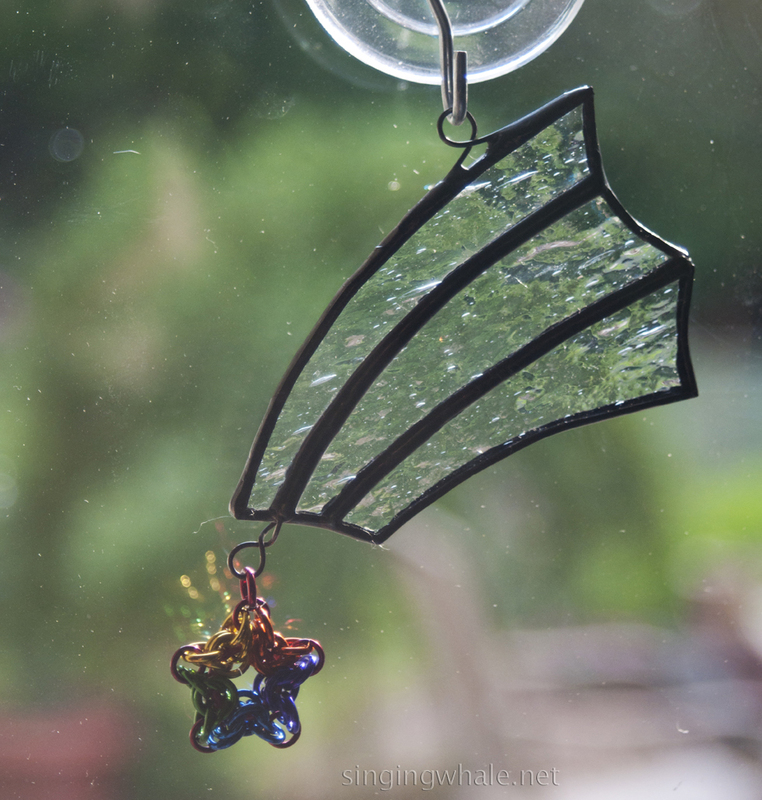 I’ve been plugging right along in the endeavor of creating mixed media pieces where I combine stained glass with chainmaille. 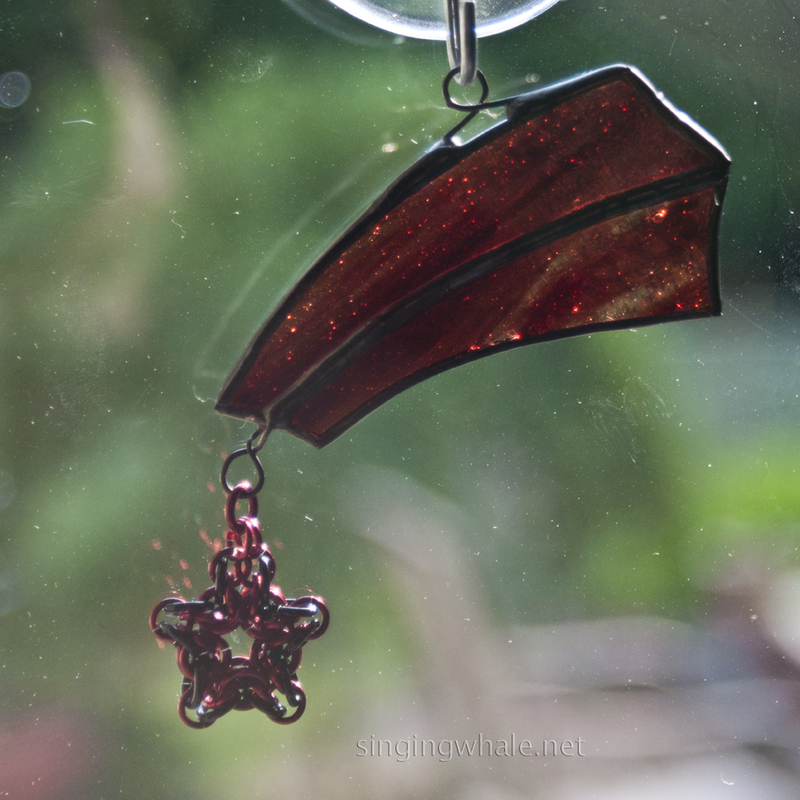 The latest result: shooting stars. 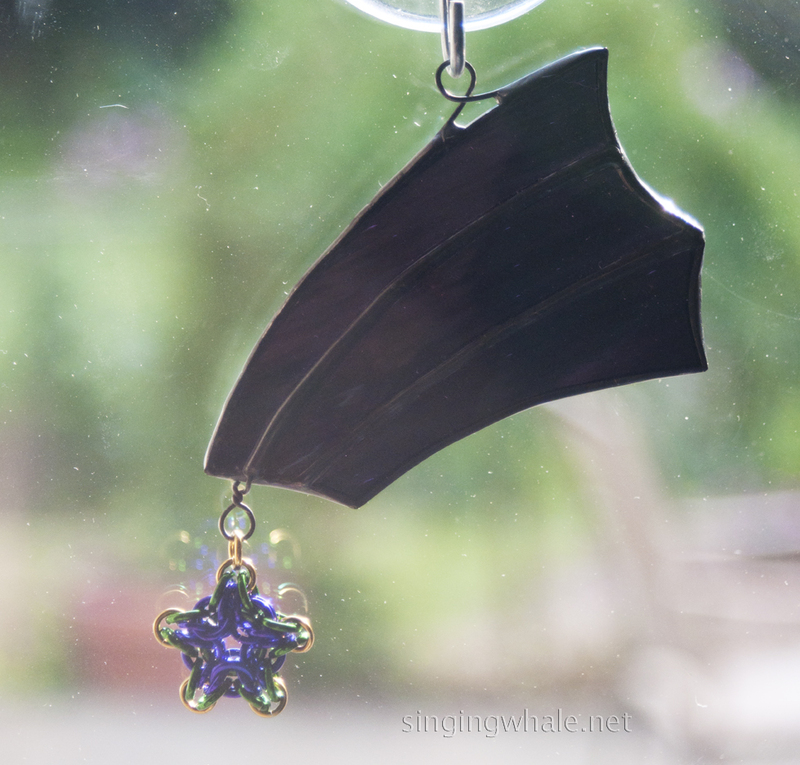 Previously, I had been making all glass shooting stars from a sort of stock pattern I found on line, but I would often get frustrated with the narrow pieces in the tail, having a lot of breakage. 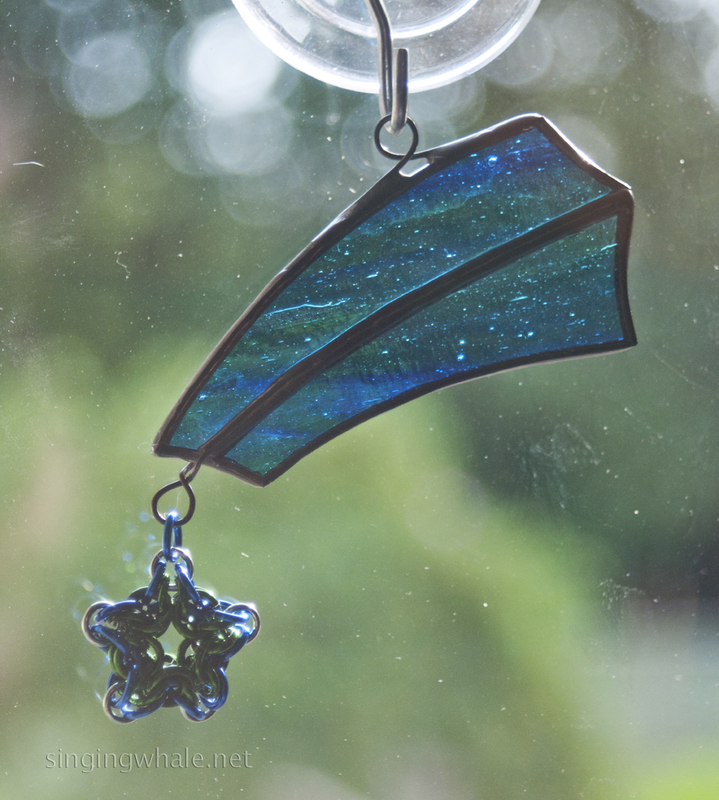 It’s been a goal for a long while to create my own shooting stars as the glass ornaments have been fairly popular. 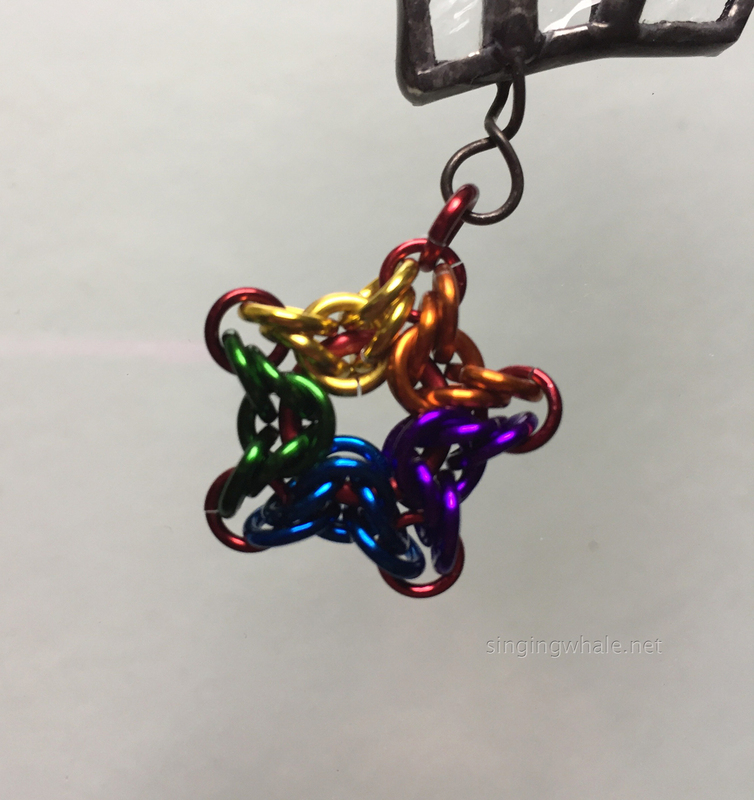 Then I recently was playing around with making chainmaille byzantine stars, a fun looking piece I’d seen in many places online. The stars were smaller than I thought they’d turn out to be, about an inch across. 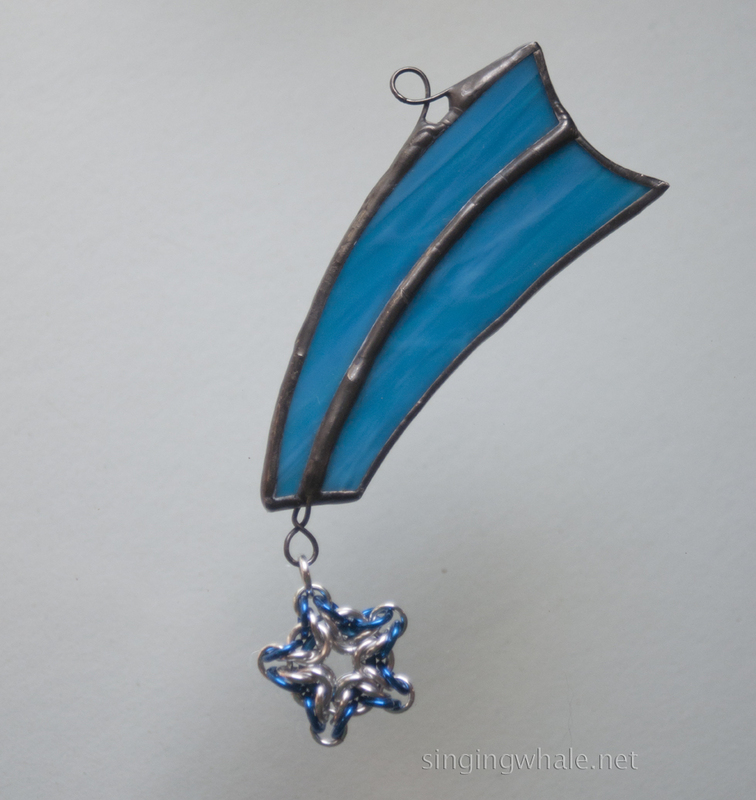 And then it occurred to me – this might work for a new shooting star! 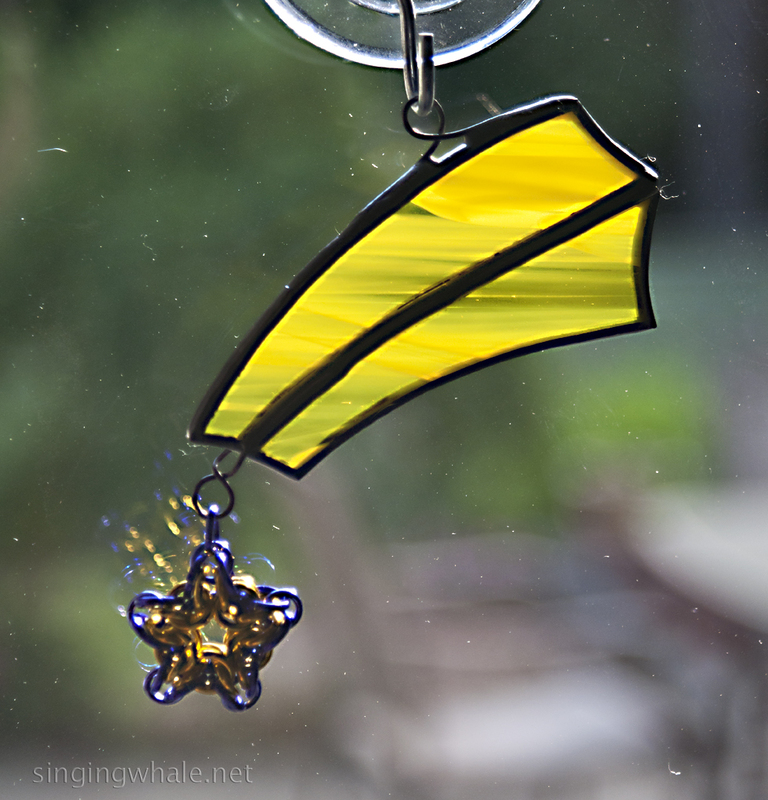 Next step was the tail for the shooting stars. Now, I can’t really draw worth anything, but a few passes and flourishes with pencil on paper, and I had something, a three piece tail. 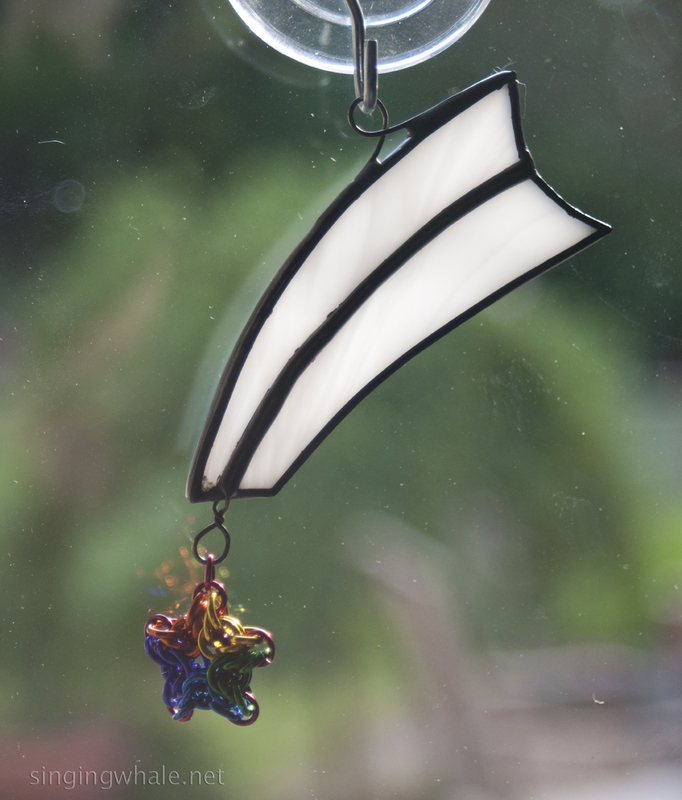 Not being one to start small, I immediately traced and cut 9 samples in various colors and glass textures. 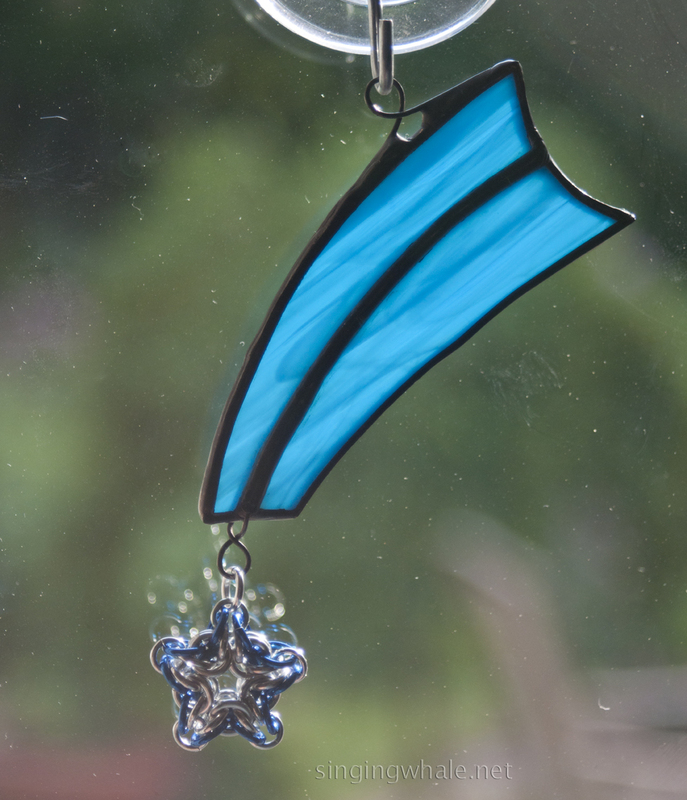 Looking at the cut glass with a star, the three piece tail felt like it might be a hair too much proportionally, so I took off the top piece on three, and the bottom piece on three others, giving me three versions. I kinda like all three! 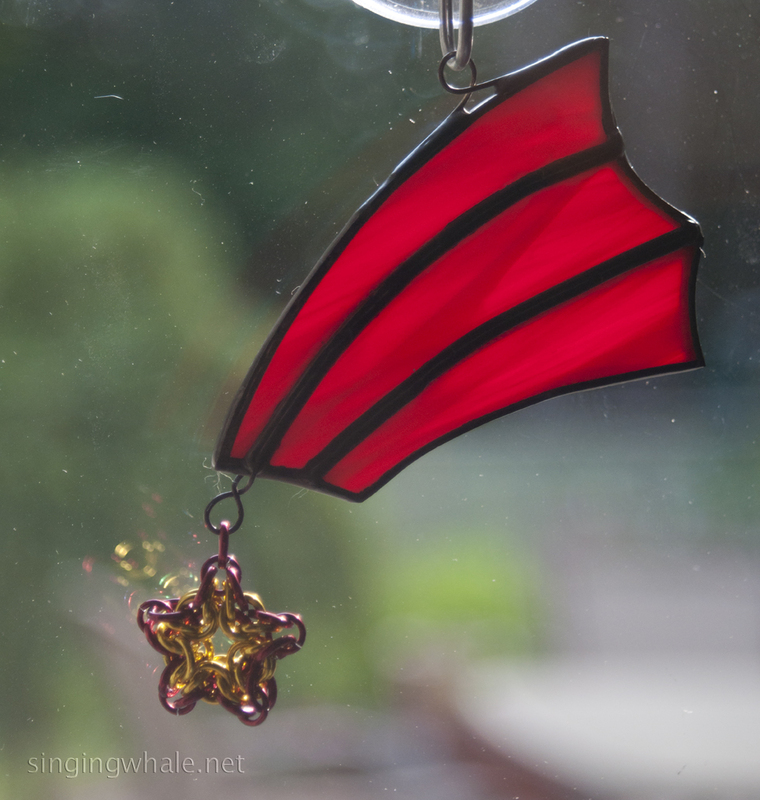 I made enough chainmaille stars to match up the glass I had cut, and now I am off and running! The overall length is about 4 inches. Width of the glass depends on two or three pieces. Widest point on the 2 piece is 1 1/2″, and on the three piece version, it’s about 2″. 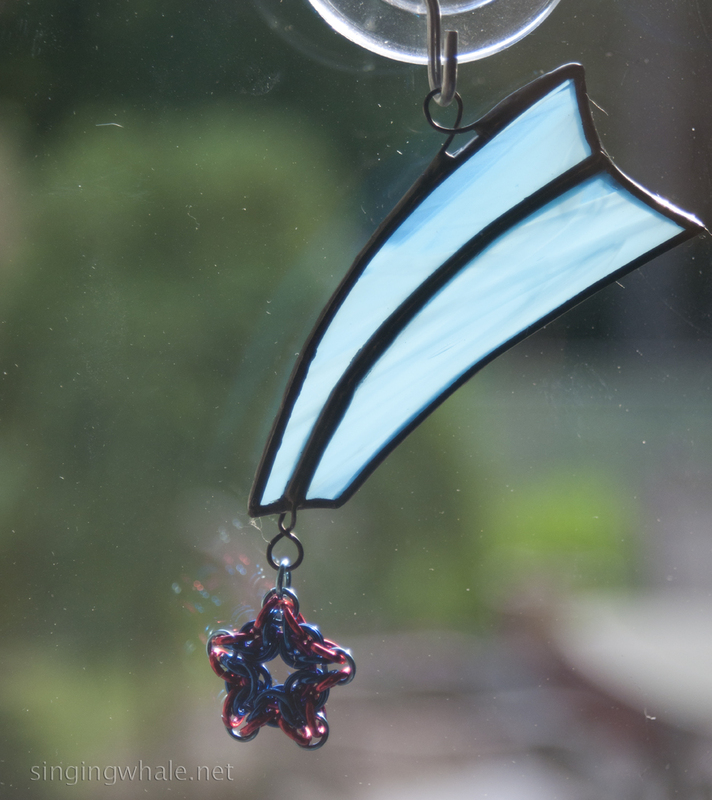 There are many color option between the rings in the stars, and the colors for glass. 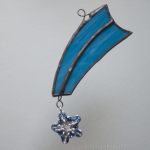 Check the Etsy store to see what’s available at any given time, with each ornament being $10. Or, make a custom request for your own colors! 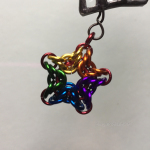 This entry was posted in chain maille, mixed media and tagged byzantine star, chainmaille, mixed media, shooting stars, stained glass, star, stars. Bookmark the permalink.